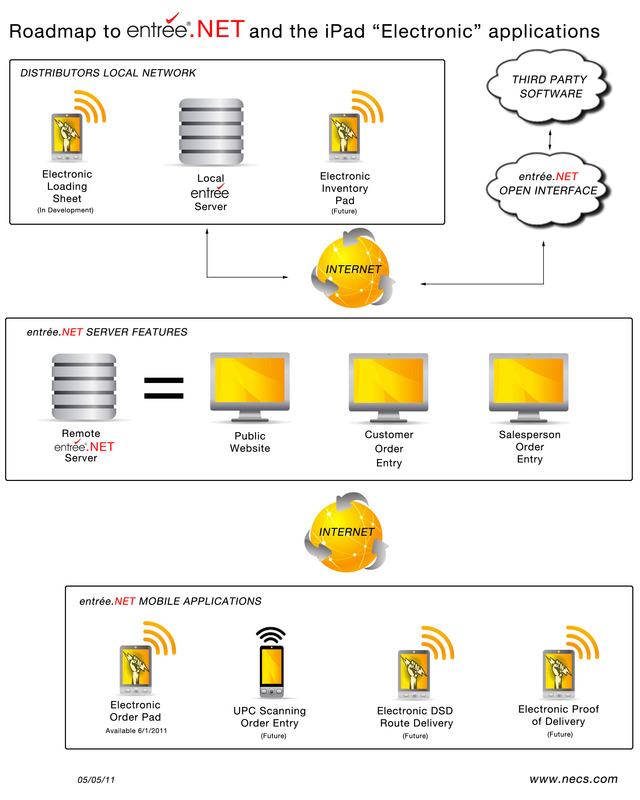 In order to help our customers visualize how the ELECTRONIC ORDER PAD communicates with their office server, and to show the evolving importance of entree.NET to manage this communication including future iPad / Android applications, we have put together a graphical diagram which shows these relationships. The diagram also shows other iPad / Android based applications we are currently working on (such as the ELECTRONIC LOADING SHEET) and what we have planned for the future. These new applications form our new "ELECTRONIC" series. The ELECTRONIC ORDER PAD is our first mobile application based off entrée.NET. This means the ELECTRONIC ORDER PAD communicates directly with a remote entrée.NET secure server, and not your local server in your office. Your data is sent to the entrée.NET server by means of our automated scheduler application that runs on your local network. You tell it how often to do things such as update inventory, special pricing, promotions, credit hold customers, import new orders, etc. The ELECTRONIC ORDER PAD is a “connected” application. This means your iPad must have Internet access to create orders, etc.. This can be either WIFI or through a cell network such as Verizon with their data plan. We designed both the entrée.NET system, along with the ELECTRONIC ORDER PADS, to have an “Open Interface”. This means we can provide your IT staff with the data file layouts needed to export information into entrée.NET and then import the orders into your current software. We know that we are onto something groundbreaking with entrée.NET, the ELECTRONIC ORDER PAD, and other planned mobile applications we are building, and wanted to be able to offer this to distributors besides just current NECS customers. Also, if you are a competitor to NECS software, and are interested in offering these solutions to your customer base, please contact NECS president, Chris Anatra (email: chris@necs.com), for more information.